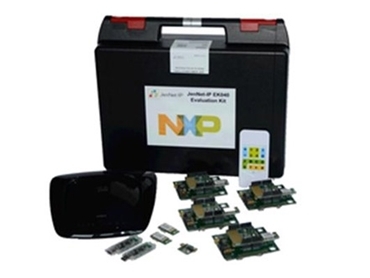 NXP Semiconductors announces the availability of evaluation kits featuring JenNet-IP wireless network layer software for the Internet of Things. The JenNet-IP-EK040 evaluation kit provides all the components needed to create applications for IPv6-based networks for lighting and home automation based on NXP’s JN514x series of ultra-low-power single-chip wireless microcontrollers. NXP is launching a certification program for JenNet-IP, which will provide for testing end products to ensure performance and interoperability between all devices bearing the JenNet-IP name and logo. Up to 500 devices in the home can each have their own unique IPv6 address with the JenNet-IP evaluation kit, turning the home into an extension of the Internet cost-effectively. Lights and various home appliances can be easily connected, monitored and controlled over the Internet. For example, GreenWave Reality’s Connected Lighting solution using JenNet-IP allows for the intelligent management and control of lighting without touching any wiring or switches in the home. The GreenWave Reality solution enables consumers to manage the use of lights with their handheld remote or through the use of smart controls. Internet-enabled smart lighting alone could reduce power consumption by 30% by dimming and turning off lights when they aren’t required. The JenNet-IP-EK040 evaluation kit comprises of four wireless sensor nodes including modules based on JN5148-J01 and JN5142-J01 chips, USB micro-B connectors, a JN514x IO expansion port, support for USB, battery or an external power supply unit (not included) and two USB cables. JenNet-IP evaluation kits are available from Glyn High-Tech Distribution .